Several months ago, I moved into a two bedroom apartment. We had great success deciding what to do with one of the bedrooms (put our bed in it), but the other one remains an enigma of possibilities. We planned on getting a futon and making a super sweet guest room, but the problem with owning fuel efficient cars is they just don't have the carrying capacity to super sweeten domiciles. Maybe they're capable of just plain sweetening, but that's a level of vanilla I do not want to contemplate. So I'm left with a room that's basically empty. Currently, the room exists solely to house our cats' litter boxes. While this fulfills a great need, for some reason I have trouble seeing guests hanging out in the “Room o' Poop”—although that really just might be a naming issue. I do have several possibilities for making this room awesome. The only problem with awesome ideas is they're too awesome, and deciding which one to go with is difficult. Here's a couple of my ideas. If you have any suggestions feel free to leave a comment! 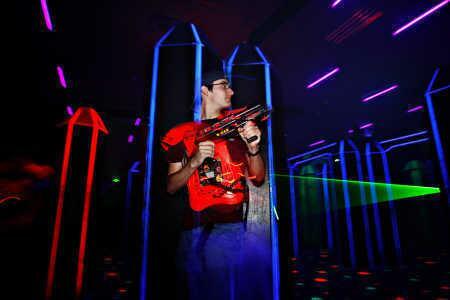 Laser Tag Room: You might say what makes Laser Tag laser tag is the lasering and the tagging, and this level of cool cannot occur in a 132 square foot room. And I totally agree with you, but keep in mind, nobody has dropped ecstasy yet. Urinal Room: I figure the cats are already peeing up a storm, why can't I? I'm imagining a solitary urinal along one wall, a trough one along the 12 foot wall, and if I get really ambitious I'd mount one on the ceiling. Sure, I'd need to overcome some amount of fluid dynamics, but the ease of pee would make it well worth it. If I install enough urinals, we can utilize the room for familial bathrooming—my girlfriend might take issue with this, but in time she will learn. Milk Dud Room: Everyone wants a room that has a lot of Milk Duds in it. I'm not talking about the insignificant 50 boxes the average person keeps in their bedstand. That hardly qualifies as “a lot.” I'm talking about “a lot.” What I'd like to do is literally fill a room floor to ceiling with Milk Duds. I want the door to open and wave after wave of Dud to stream forth. If it doesn't kill someone, the room has not done its job. Plus, once we remove the bodies, it would taste delectable. M.C. 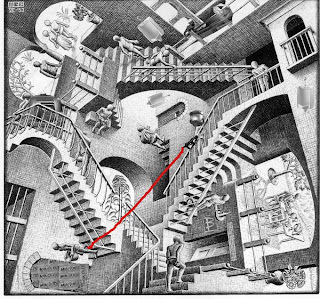 Escher's Relativity room: Just imagine walking into a room and suddenly find you're walking along stairs on the wall, but is that the wall, or is that the ceiling? To walk among this room is to question one's sense of gravity, place, sanity and hygiene. It's so mind tripping, you don't even need to drop ecstasy (please though, no Laser Tag in the Escher room, it will not end well). McDonald's Room: Remember in “Richie Rich” with Macualey Culkin, when Richie wanted to show he had really arrived, he took the kids he kidnapped to his own McDonald's in his own house. Well I'm apparently just one smushed circus animal and styrafoam container away from that level of awesome. Toxoplasmosis Room: What's the one thing everyone comments “This house could use some more of.” Toxoplasmosis, of course. But not everyone can have an endless supply of the delightful disease that causes inflamation of the brain and neurological problems. I want the walls literally painted with this whimsically named disorder—thats is, unless its coloring is like a chartreuse. Oh, and if any pregnant women would like to drop by... please don't. Really. Kill Room: The plastic sheets, the gurney, the bathtubs of blood, the rolls of duct tape. It seems like a little bit of heaven right on earth, because really, a good kill room shouldn't be depressing, it should really be seen as a welcoming, heartwarming homestead for all the runaways, drifters and circus clowns of the world. I don't know how I've made it 26 years without one. With so many good ideas kicking around, I'll probably just end up combining them into some sort of urinal-filled, gravity-defying, laser-bending, blood-curdling, diabetic coma-inducing, McRoom of disease that my cats can still use to do their nasty business. The best part is, this paragraph can serve as the pitch to convince my girlfriend we need a Relativity Urinal Milk Dud Cat Poop McD Laser Tag Disease room! UPDATE: Since writing this article, we got a futon. My cat has pooped on it three times.